The mottled wood owl (Strix ocellata) belongs to the family Strigidae under the order Strigiformes. The family Strigidae comprises around 189 living species, divided into 25 genera. These birds are nocturnal and mostly arboreal. They have large heads, short tails, facial disc, camouflaging plumage and large eyes. The females are generally larger than the males and there is no sexual dimorphism in their plumage. They have large, broad, long and rounded wings. The feathers are soft and the base of each is downy, helping in silent flight. 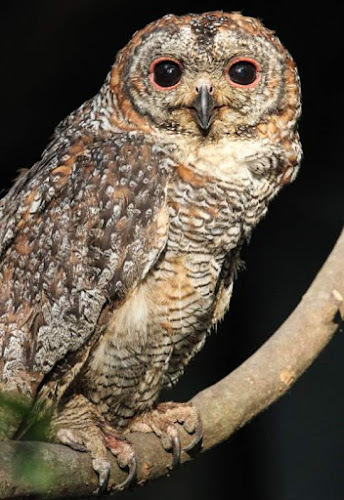 The genera Strix is characterized by nocturnal habits, medium to large size, robust, well-built body, strong muscles, lack of ear tufts, lack of visible ears, vocalisation through hooting and feeding on small mammals, birds and reptiles. The mottled wood owl (Strix ocellata) is a large owl belonging to the family, Strigidae. 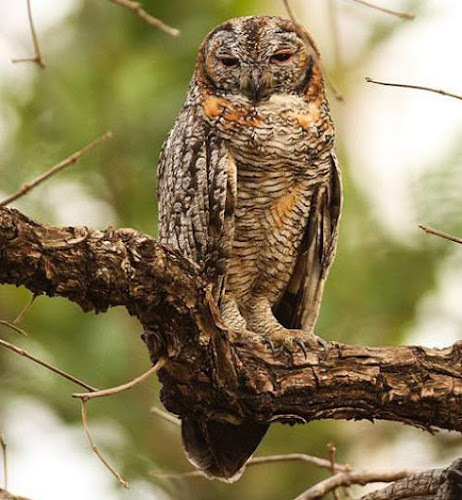 The mottled wood owl species are endemic to India. These species are typical owls and lack "ear" tufts. There are three recognized subspecies of these owls. The mottled wood owl (Strix ocellata) is a large typical owl, measuring 40 to 50 cm in length and weighing 700 to 800 grams. Both the sexes look alike. They are nocturnal and roost in the day, usually in pairs or in small family groups. These mottled wood owls have distinctive, well developed facial disc, extending equally above and below the eyes. The facial disc is whitish with concentric, fine, black barring and random rufous orange mottling. They lack "ear" tufts. The upperparts of the mottled wood owl species are grayish with rufous-brown and gray mottling and vermiculation. The chin is whitish. There is narrow black and white barring in the medium-sized tail. The underparts are whitish with black barring. The curved beak is black. The irises are reddish brown and the eyelids are coral-red. The tarsi and toes are feathered in adults and are bare in juveniles. Their call is a loud, quavering, eerie “chuhua-aa” sound. These mottled wood owl species are endemic to India. Unconfirmed reports of their sightings were reported from Myanmar and Pakistan. The mottled wood owl nominate subspecies S. o. ocellata is distributed in peninsular India. The subspecies S. o. grandis is distributed in the states of Gujarat, parts of Maharashtra and parts of Rajasthan. The subspecies S. o. grisescens is distributed in the states south of the base of Himalayas, including Punjab, Rajasthan, Haryana, Uttar Pradesh, Madhya Pradesh, Chhattisgarh, Odisha, Jharkhand and Bihar. These mottled wood owl species have moderate forest dependence. These species occur in altitudes from 0 to 100 meters. The artificial ecosystems of these mottled wood owl species include agricultural lands, pasture lands, rural gardens, plantations, urban parks and other urban areas. The natural ecosystems of these species include tropical and subtropical moist lowland forests, wooded plains, trees with dense foliage, tropical and subtropical dry shrublands and dry savanna. The diet of these mottled wood owl species is mostly rodents. Rats, mice, palm squirrels, small birds, crabs, lizards and large insects are their primary food. The breeding season of these mottled wood owl species is from November to April in peninsular India. The laying season is during february and March in northern India. These owl species are monogamous. These mottled wood owl species nest in natural hollows and holes in trees. The nest is not lined. In rare cases they have been observed to nest in abandoned stick nests of large birds. The typical clutch contains two or three creamy-white ovoid eggs. The female incubates the eggs for about 30-32 days. The mottled wood owl species are non-migratory resident birds. Post breeding, the juvenile owls may disperse and establish in new locations within the range. They may make local movements for feeding and breeding within their range. 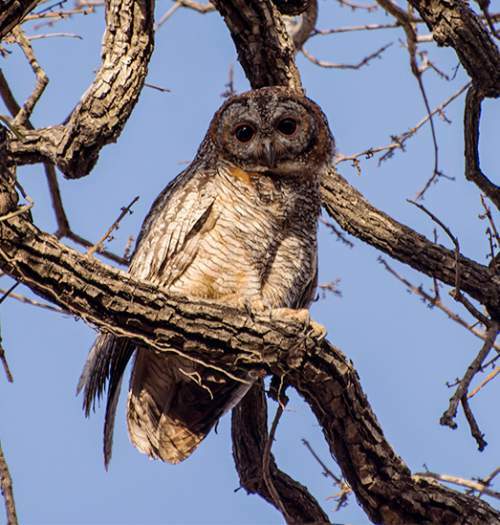 The three recognized subspecies of mottled wood owl (Strix ocellata) are: Strix ocellata ocellata (Lesson, 1839), Strix ocellata grisescens Koelz, 1950 and Strix ocellata grandis Koelz, 1950. 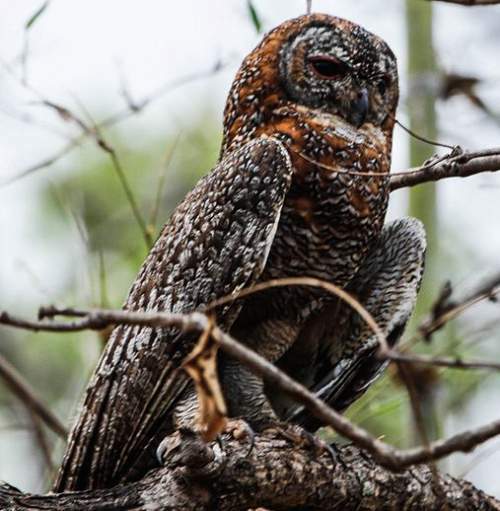 The global population size of the mottled wood owl (Strix ocellata) has not been quantified. 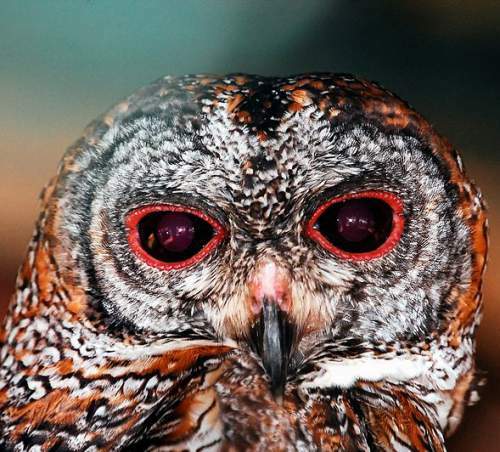 The overall population trend of these owl species is reported to be stable. Throughout its range it is reported to be uncommon to scarce. The generation length is 9.6 years. Its distribution size is about 2,790,000 sq.km. The mottled wood owl (Strix ocellata) does not approach the thresholds for being Vulnerable, either under the range size criterion, or under the population trend criterion, or under the population size criterion. 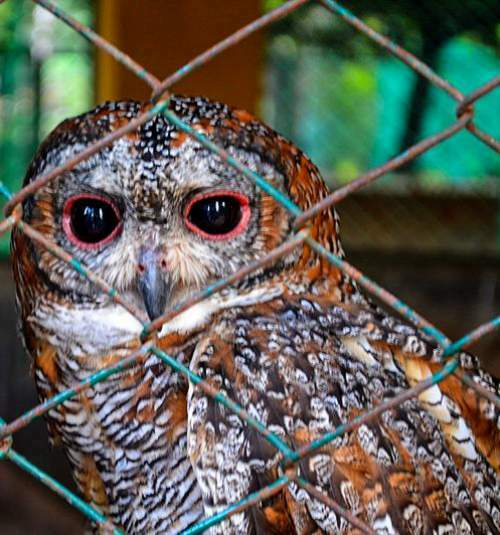 The ongoing habitat destruction and trapping for pet trade are the main threats that may endanger the survival of these owl species. The IUCN (International Union for Conservation of Nature) has categorized and evaluated the owl species and has listed it as of "Least Concern". 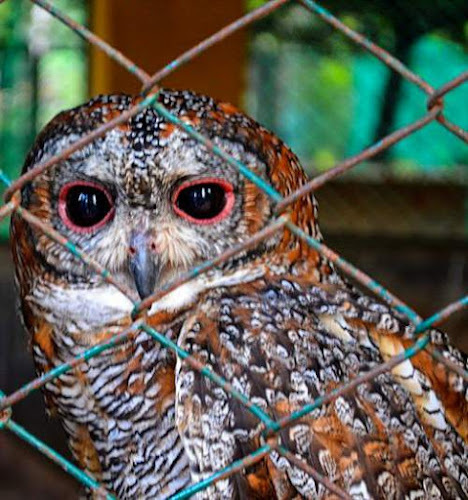 The CITES (Convention on International Trade in Endangered Species of Wild Fauna and Flora) status is ‘Evaluated’ for the mottled wood owl (Strix ocellata) and listed in Appendix II. The house swift (Apus nipalensis) is a small swift belonging to the family, Apodidae. These swift species are distributed in Nepal, northeast India, Bhutan, Bangladesh, south and southeast China, Taiwan, South Korea, Japan and southeast Asia. In May 2012, a house swift had landed near Vancouver, Canada, flying across the Pacific Ocean. There are four recognized subspecies of these swifts. The house swift (Apus nipalensis) is closely related to the white-rumped swift (Apus caffer), Bates's swift (Apus batesi), Horus swift (Apus horus) and the little swift (Apus affinis). The four recognized subspecies of house swift (Apus nipalensis) are: Apus nipalensis nipalensis (Hodgson, 1837), Apus nipalensis subfurcatus (Blyth, 1849), Apus nipalensis furcatus Brooke, 1971 and Apus nipalensis kuntzi Deignan, 1958. The house swift (Apus nipalensis) is a small-sized swift, measuring 14 to 15 cm in length and weighing 20 to 25 grams. Both the sexes look alike. 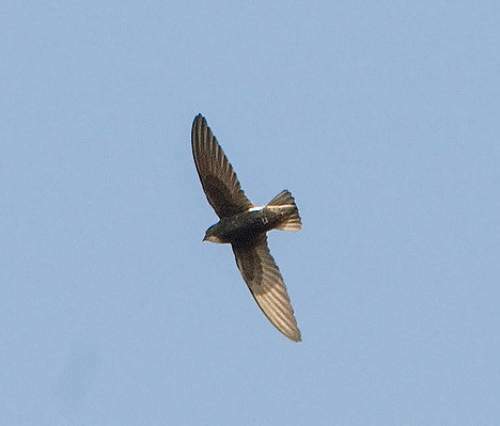 These house swift have distinctive blackish brown back, wings, tail and abdomen. There is slight bluish green gloss on the back and the wings. The crown, face and the breast are blackish-brownish gray. The rump and the adjacent flanks are white. There is a white throat patch. The forehead, lores and malar streak are pale brownish gray. The tail is medium-sized and squarish and has a slight, shallow, discernible fork. The bill is black. The irises are dark brown. The legs are black with purple tinge. The house swift call is a loud, fast, twittering "de-de-de-dedede" sound. These house swift species are distributed in Nepal, northeast India, Bhutan, Bangladesh, Myanmar, south and southeast China, Taiwan, South Korea, Japan, Thailand, Cambodia, Laos, Vietnam, Malaysia, Singapore, Indonesia, Brunei and Philippines. 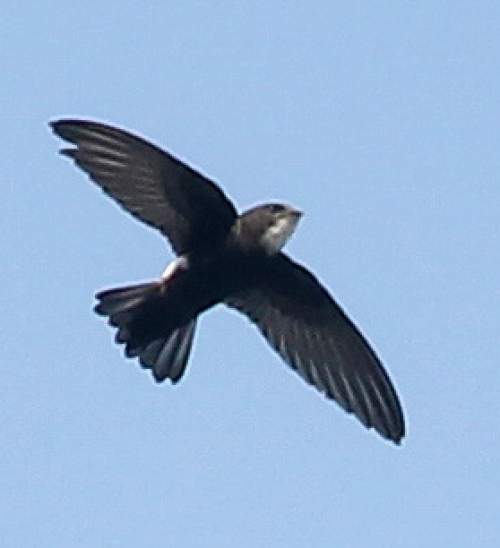 The house swift nominate subspecies A. n. nipalensis is distributed in Nepal, northeast India, Bhutan, Bangladesh, Myanmar, south and southeast China, South Korea, Japan, Myanmar, Thailand, Cambodia, Laos and Vietnam. In India, the subspecies A. n. nipalensis is distributed in the states of northern West Bengal, Sikkim, Assam, Arunachal Pradesh, Meghalaya, Nagaland, Manipur, Tripura and Mizoram. The house swift subspecies A. n. kuntzi occurs in Taiwan. The subspecies A. n. furcatus is distributed in Java and Bali (Indonesia). The subspecies A. n. subfurcatus is distributed in Malay Peninsula, Singapore, Brunei, Indonesia and Philippines. These house swift species have low forest dependency. These species occur in altitudes from 0 to 2100 meters. The artificial ecosystems of these swift species include urban areas. The natural ecosystems of these species include tropical and subtropical moist lowland forests, tropical and subtropical moist montane forests and temperate forests. The diet of these house swift species is mostly flying insects. Aeroplankton (or aerial plankton), flies, airborne spiders, moths, butterflies, flying termites and ants, dragonflies, locust, cicadas, grasshoppers, crickets and mantises are their primary food. These house swift species are excellent aerial foragers, hawking insects on the wing. They are exceptionally agile in flight and drink by skimming the water surface while flying. The hatchlings are fed with food balls, a mass of insects bound together by saliva. The breeding season of these house swift species is from February to September in northeast India and Myanmar. The breeding season is during March and July in Malay Peninsula. These species are colonial breeders. These house swift species nest inside buildings, under bridges, on cliffs and in the mouth of caves. The nests are bottle-shaped and often clumped together. The nest is built with feathers, leaves and grass cemented together with saliva. The typical clutch may contains one to four oval white eggs. The house swift species are non-migratory resident birds. Post breeding, the juvenile swifts may disperse and establish in new locations within the range. They may make local movements for feeding and breeding within their range. The global population size of the house swift (Apus nipalensis) has not been quantified. The overall population trend of these species is reported to be increasing. Throughout its range it is reported to be very common and abundant. The generation length is 12.5 years. Its distribution size is about 20,700,000 sq.km. The house swift (Apus nipalensis) does not approach the thresholds for being Vulnerable, either under the range size criterion, or under the population trend criterion, or under the population size criterion. The ongoing habitat destruction is the main threat that may endanger the survival of these species. The IUCN (International Union for Conservation of Nature) has categorized and evaluated the swift species and has listed it as of "Least Concern". The CITES (Convention on International Trade in Endangered Species of Wild Fauna and Flora) status is ‘Not Evaluated’ for the house swift (Apus nipalensis). Current topic in Birds of India: House swift - Apus nipalensis. The pied kingfisher (Ceryle rudis) belonging to the family Alcedinidae under the order Coraciiformes. The species Ceryle rudis are quite gregarious and they congregate at communal roosting sites at night. Quite often cooperative (communal) breeding is observed in these species of birds. The non-breeding siblings from earlier brood have been found to help the parents in raising the hatchlings; sometimes even unrelated older birds have been found to help. The adult male and female ratio of these species is skewed and there is surplus of males probably due to a higher mortality rate among the breeding females. The incubating and brooding activity at night is done exclusively by the female. Consequently, the females are more exposed to dangers like caving in of nesting tunnels, flooding and nest predation. Many of the surplus males take up the role of primary/secondary helpers, assisting the breeding pair in protecting the nesting site as well as bringing food for the nestlings. 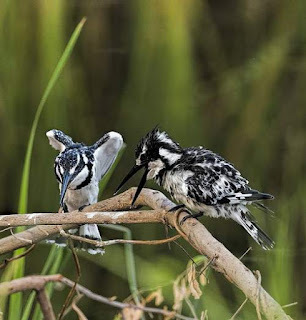 Current topic in Birds of India: Pied kingfisher (Ceryle rudis) photos. 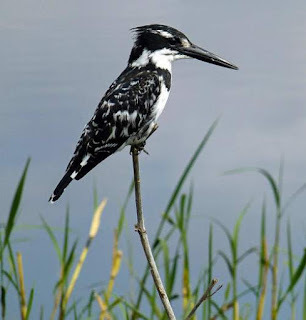 The pied kingfisher (Ceryle rudis) is a water kingfisher belonging to the family, Alcedinidae. 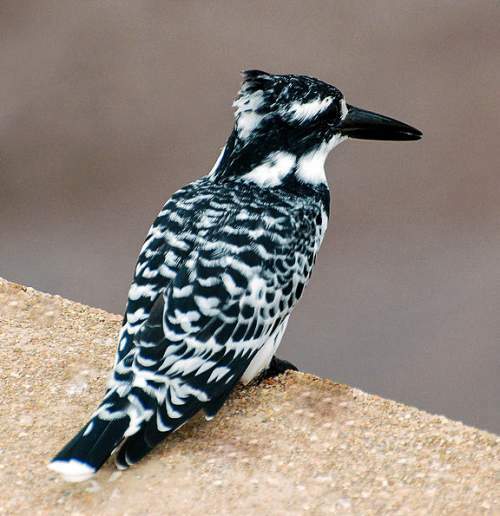 The pied kingfisher species are widely distributed across Indian subcontinent, Africa and Asia. These kingfisher species are the only member of the genus Ceryle. There are four recognized subspecies of these kingfishers. The pied kingfisher (Ceryle rudis) is a medium-sized kingfisher, measuring 25 to 26 cm in length and weighing 70 to 110 grams. 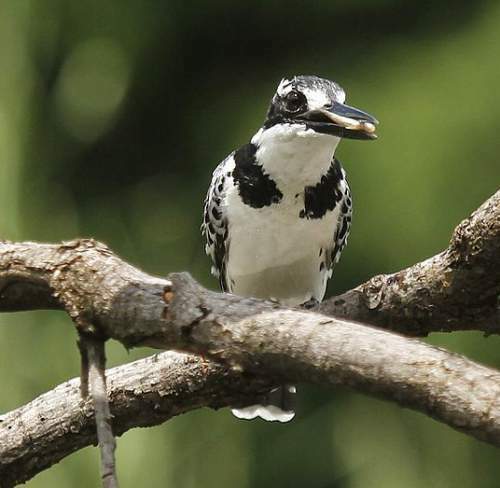 These pied kingfishers have distinctive black and white plumage. The crown and the crest are black. The upperparts are barred in black. The male birds have a black double band across the breast whereas the females have a single band broken at the middle of the breast. In these kingfishers, the lower breast and the rest of the underparts are white. There is a white stripe (supercilium) running from the base of the beak above the eye, finishing towards the rear of the crest. The tip of the black banded tail is white. The kingfisher bill is black. The irises are black. The feet are black. Their call is a loud “kwik-kwik” or a sharp "chirruk-chirruk" sound. 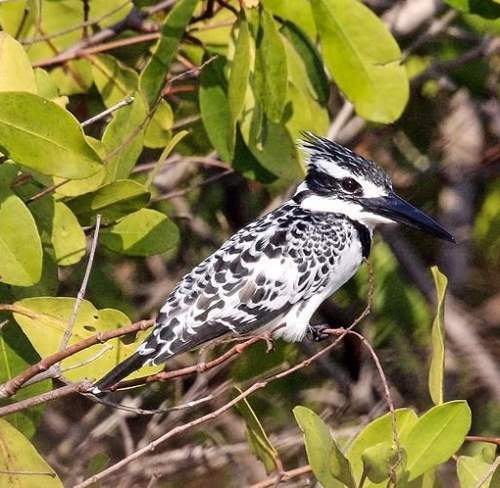 These pied kingfisher species are widely distributed in Africa and Asia. They are distributed in Indian subcontinent, Africa, Middle East, southern China and northern part of southeast Asia. The pied kingfisher subspecies C. r. leucomelanurus are distributed in Afghanistan, Pakistan, India, Nepal, Bhutan, Bangladesh, Sri Lanka, Myanmar, Thailand, Cambodia, Laos and Vietnam. The kingfisher subspecies C. r. travancoreensis is distributed in southwest India. 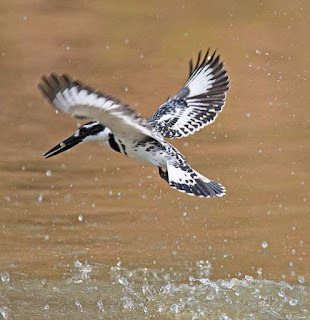 In China, the pied kingfisher subspecies C. r. insignis are distributed in the provinces of Sichuan, Yunnan, Guizhou, Hubei, Hunan, Guangxi, Hainan, Guangdong, Jiangxi, Fujian, Anhui, Jiangsu and Zhejiang. 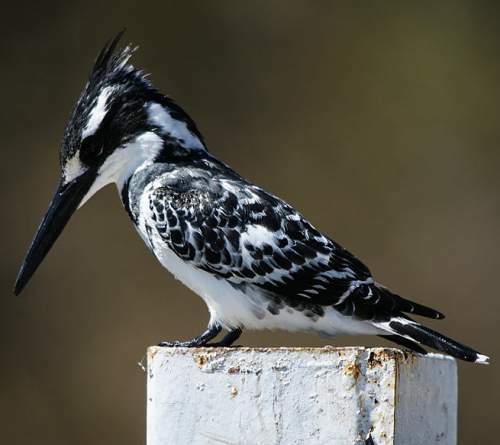 In the Middle East, the pied kingfisher subspecies C. r. rudis are distributed in Iran, Iraq, Syria, Turkey, Lebanon, Israel and Jordan. 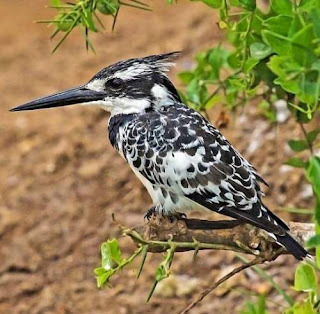 In Africa, the pied kingfisher subspecies C. r. rudis is distributed in Egypt, Sudan, Eritrea, Ethiopia, Somalia, South Sudan, Uganda, Kenya, DR Congo, Chad, Central African Republic, Cameroon, Nigeria, Benin, Togo, Mali, Ivory Coast, Ghana, Liberia, Sierra Leone, Burkina Faso, Guinea, Gambia, Senegal, Mauritania, Guinea-Bissau, Equatorial Guinea, Republic of the Congo, Gabon, Tanzania, Rwanda, Burundi, Angola, Zambia, Malawi, Mozambique, Zimbabwe, Namibia, Botswana, South Africa and Swaziland. The Important Bird and Biodiversity Area (IBA) of these kingfisher species in Turkey are Southern Euphrates Valley, Birecik Plains, Dicle Valley, Karkamış, Cizre and Silopi. 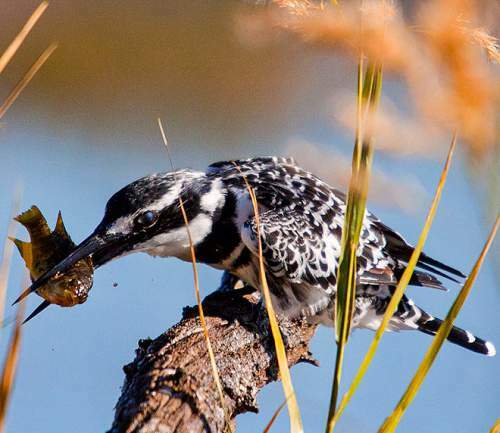 These pied kingfisher species have low forest dependency. These species occur in altitudes from 0 to 2500 meters. The artificial ecosystems of these pied kingfisher species include, water logged excavations, flooded, irrigated lands, irrigational canals, dams, reservoirs, water storage ponds and lakes. The natural ecosystems of these pied kingfisher species include tropical and subtropical mangrove vegetation, wetlands, flooded grasslands, freshwater lakes, marshes, marine lagoons, rocky, sandy and gravel shoreline, macroalgae covered seas, estuaries, rivers, streams and creeks. 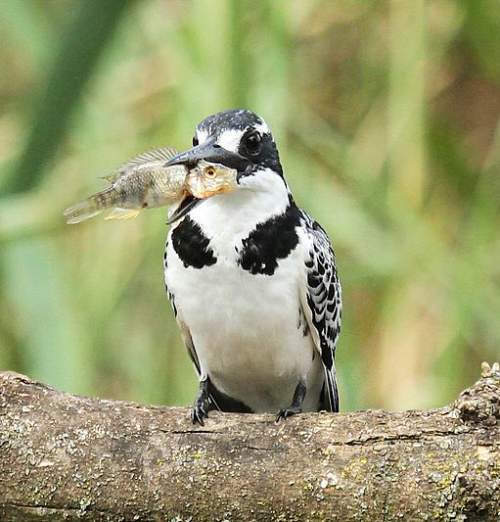 The diet of these pied kingfisher species is mostly fish. Crustaceans, fish, amphibians and aquatic insects are their primary food. These birds hunt from perches near water. Diving into the water, they catch the prey with bill. 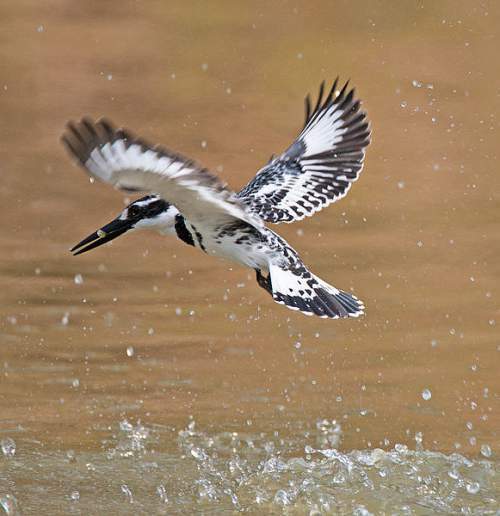 These pied kingfishers also hover over the water before diving for the prey. Smaller prey is swallowed on the wing. Larger prey is brought to the perch and bashed repeatedly till it is immobile and then swallowed whole. The breeding season of these pied kingfisher species is from February to April in northern India. The breeding season is during August and September in Middle East. The laying season is from March to June in Jammu and Kashmir (India) and northern Pakistan. These pied kingfisher species are monogamous. There is initial courtship before mating. There may be colonial breeding. The family group may function as primary helpers or secondary helpers. The pied kingfisher nesting sites are located in vertical mud banks and sometimes in flat grassy ground. The nesting tunnel of about 1.25 meters long is excavated by the breeding pair. The tunnel ends in the unlined incubating chamber. The typical kingfisher clutch contains four to five oval white eggs. The pied kingfisher species are non-migratory resident birds. Post breeding, the juvenile kingfishers may disperse and establish in new locations within the range. They may make local movements for feeding and breeding within their range. The four recognized subspecies of pied kingfisher (Ceryle rudis) are: Ceryle rudis rudis (Linnaeus, 1758), Ceryle rudis leucomelanurus Reichenbach, 1851, Ceryle rudis travancoreensis Whistler, 1935 and Ceryle rudis insignis E. J. O. Hartert, 1910. The global population size of the pied kingfisher (Ceryle rudis) has not been quantified. The overall population trend of these kingfisher species is not known. Throughout its range it is reported to be common and widespread. The generation length is 4.4 years. Its distribution size is about 69,300,000 sq.km. The pied kingfisher (Ceryle rudis) does not approach the thresholds for being Vulnerable, either under the range size criterion, or under the population trend criterion, or under the population size criterion. The ongoing habitat destruction and use of poisons to kill fish are the main threats that may endanger the survival of these kingfisher species. The IUCN (International Union for Conservation of Nature) has categorized and evaluated the kingfisher species and has listed it as of "Least Concern". The CITES (Convention on International Trade in Endangered Species of Wild Fauna and Flora) status is ‘Not Evaluated’ for the pied kingfisher (Ceryle rudis). Current topic in Birds of India: Pied kingfisher - Ceryle rudis.